MELBOURNE great-turned-Hawthorn assistant coach Adem Yze will cast his emotions aside to help plot the Demons' finals downfall on Friday night. Yze is third on Melbourne's all-time games played list with 271, behind only David Neitz (306) and Robbie Flower (272), and booted 234 goals in a stellar career. The silky left-footer won the Demons' club champion award in 2001, was an All Australian in 2002, and played in the 2000 Grand Final against Essendon. Yze is in his seventh year as a Hawks coach, graduating from goalkicking specialist to development coach, before overseeing the club's defence for two years, then the forwards the past two seasons. His time at Hawthorn coincided with being part of master coach Alastair Clarkson's staff for the premiership three-peat between 2013 and 2015. Only one of the Hawks and Melbourne will progress to a preliminary final, with the former winning by 67 points in the clubs' sole clash this year in round four. "We were disappointed with our result last week (against Richmond), but that's footy and that's why you get a double chance," Yze told AFL.com.au. "We'll look at some things from last time we played Melbourne … like what we did at stoppages, and even Max Gawn's strengths. "But, all in all, we'll look more at their recent form, because they've been really good the last three weeks, so that's going to take priority." As forwards coach, Yze had extra reason to be frustrated at Luke Breust's and Shaun Burgoyne's elementary misses last week, but could see the lighter side of them a week on. "I'll give Shaun an out for getting a fair hit to the head (beforehand), then he had a bit of a crook neck from it, so I'll say his was 'delayed concussion'," he joked. "But 'Punky' (Breust) is normally a terrific kick and I think he just relaxed too much, and in those conditions … it just skidded off the side of his boot. "We looked at that – we didn't look at it too many times, though – but I can tell you 'Clarko' wasn't too happy that those two shots at goal didn't go through." Yze joined his fellow Hawthorn coaches in watching Melbourne end Geelong's season last week, and bumped into old teammates Jeff Farmer, Brad Green and Jeff White in the process. 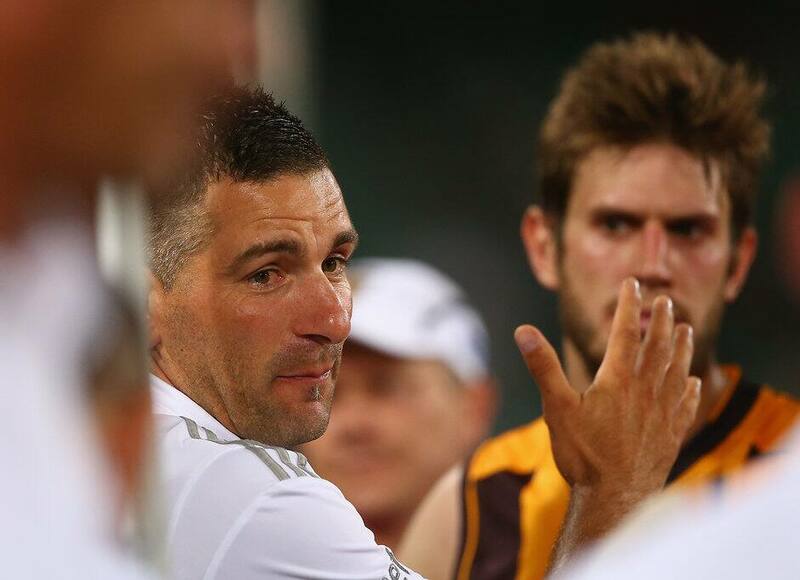 "Coaching-wise, it's hard to have that sort of emotion (about your old club). It's different if you were playing against them," he said. "When you're coaching, you're just looking at their strengths and weaknesses and trying to combat them. "On the personal side, it's actually really good to see them in the finals and really competitive again, but we're hopefully going to end that and they can start that again next year." Yze was coy about his coaching aspirations, saying only he wanted to become "the best coach I can" and was enjoying the opportunity to learn from Clarkson.